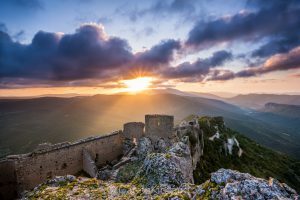 Remote Cathar Chateau Peyrepertuse Languedoc France at Sunrise. ISO100, 17mm, f/11, 1/8sec. Lee Graduated Filter No 9 Hard. Canon 1Ds MrkIII, 16-35mm, f/4L IS USM. So there you are. You’ve planned the trip. You’ve done the home work. Locations sorted via Google maps, Trip adviser, Internet libraries, etc etc. You’ve some how managed to clear, a space in you’re hectic life. The endless check list is ticked. Tent, fridge (very important), maps, loo roll (even more important), cameras, camera batteries, chargers, lap top, memory cards, external hard drives…… the list goes on. And there you go. Off into the unknown, with a wish and a prayer. Questions abound, will you get the shot? Will all the time and expense pay off? Will your family and friends ever believe your not just off on another photo jolly, but actually working. Experience tells you that you will come back with something. May be something great. But who knows? As exiting as these trips are, in reality, I’m a bit of a home boy at heart. Not the intrepid explorer that you read about in all the photo magazines. I’m not a loner by nature. I love the company of family and friends. So these trips are challenging in more ways than one. Sometimes when you’re in a soggy field at 4.30 in the morning as the skies close in, or as you’re tent has barely withstood the hurricane in the middle of the night, and your mattress has developed a puncture, you wonder what the hell you are doing here. Was there a point? Castle of Loret Del Mar Spain.ISO100, 19mm, f/11, 1/8sec. Lee Graduated Filter No 6 Hard. Canon 5DS R, 16-35mm, f/4L IS USM. At such times, the trip becomes a matter of endurance and perseverance. Lack of sleep, lack of comfort and often just being relentlessly cold play with your mind and can make you feel like giving up this fruitless folly, packing up the tent and going home to the warmth and familiarity of home. But resist such temptations, you must. It’s often at such times when the heavens lift, and shots that were on the ‘drawing board’ become reality. Shot after shot comes together, and the discomfort, doubt and general doom and gloom become a distant memory. Memory cards get filled, and you float on a cloud of contentment after successful dawn shoots. Often trips come down to the success of a day or two, or even a moment or two, but once you’ve got something in the bag you feel a lot more relaxed. If I come back with one or two pictures I’m happy to hang in my gallery, I consider that a success. Like it or not, your purpose is to take pictures, and if the pictures are not forthcoming its a bit of a downer. However friendly the bars are, however good the restaurants, the days are long if you cannot, due to weather, actually engage in the process of picture taking. In all photography, lighting is incredibly important. You could be at the most beautiful location on the planet, but unless the lighting conditions are conducive, the image will fall flat. On the other hand, you could have less promising subject matter, but due to a fantastic sunrise, the image is lifted to another place. I used to work in the film industry, and there, the lighting camera man is as important as the film camera man. Hours will be spent setting up the lighting to create the mood the scene needs. In landscape photography, however, we don’t have that luxury and rely totally on what the heavens choose to bestow on us, or not. I have learnt over the years, however, not to be too fixated on ‘my idea’ of what a scene should look like, and as much as possible, work with what I’m given. Sometimes, you don’t need a technicolour sunset, sometimes a more subtle effect will work better. There’s times when even a flat sky can add a simplicity to an image. Also there are locations that work better with dull, grey skies. 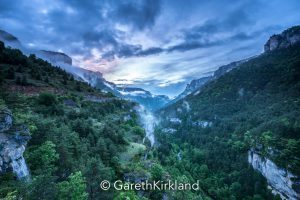 Gorges du Tarn at Sunrise France. ISO100, 16mm, f/11, 1/8sec. Lee Graduated Filter No 9 Soft. Canon 1Ds MrkIII, 16-35mm, f/4L IS USM. I was shooting round Auvergne in the Massive Central, France a while ago, and I really felt I made the most of the week I had there, working with all different weather conditions. In Auvergne, it rains a lot. I lived there for a year, so I know. So in my pre trip planning, I purposely sourced rainy day locations. Forests, waterfalls, Panoramic’s of Autumn trees, often work better with over cast skies, as direct sunlight desaturates the colours of foliage and the like. Add a polariser to get rid of any remaining reflection, and these colours can really sing. So, when the weather was great, I was out shooting mountain vistas, when it wasn’t, into the forest I would go. I think when organising a photo trip, it’s very important to think in this way. Don’t rely on good weather. Have a plan B and C, and source locations that can work when the weather is not at it’s best. In any case, every single trip is full of highs and lows. Times where you feel nothing is working, and times where your floating on a photographic euphoric cloud. With experience, however, I’ve learnt not to be too swayed by such emotions. It’s after all, a job of work, and a professional and consistent approach is essential. I’ve also learnt, that even if the pictures that you come back with aren’t quite the mind blowing images that you had hoped for, you will always come back with something worthwhile. The fact is also, that there has never been a trip that I have regretted, or felt has been a total waste of time. It’s always been an experience to savour, and I have always learnt something and hopefully developed my ability as a photographer. I also remind myself constantly, how lucky I am to be doing the work I love and inspires me. Fishing Huts in the sea Pornic France ISO100, 18mm, f/11, 1/8sec. Lee Graduated Filter No 9 Hard. Canon 1Ds MrkIII, 16-35mm, f/4L IS USM.